Josh is the most recent addition to the Professional Team at the Royal Tennis Court; originally a squash player, Josh was introduced to the game by Head Professional Nick Wood whilst studying at Kingston University. 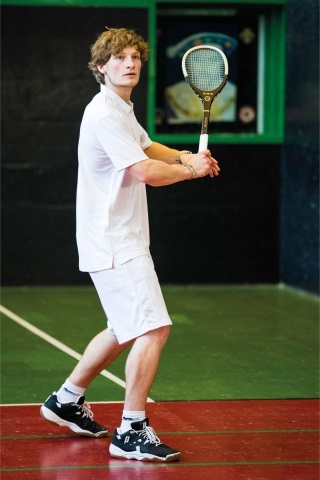 Focus on academics meant that tennis took a back seat during the University years and the studies received the benefits; after achieving his goal of a First Class degree (Psychology and Criminology) Josh was able to focus more time and energy on the sport. Having only been playing the game with serious intent for a few months, Josh successfully applied for the Trainee Professional vacancy at RTC in September 2013. Keen to justify his inclusion in a team with Nick Wood and Chris Chapman, Josh worked hard to achieve his CPD 1 qualification in December 2013 (qualifying as an Assistant Professional); an important first milestone. Now Josh’s primary goal, with the strong support of the RTC team, is to further his qualifications by achieving the CPD 2, whilst improving his abilities as a player in order to compete with the top players; to enter and be successful in tournaments.